Lifelong Financial Freedom in Singapore: How much interest do you pay for your housing loan? 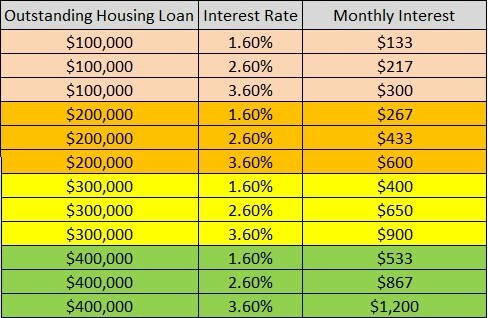 How much interest do you pay for your housing loan? For example, if the outstanding housing loan is $100,000 and the loan interest rate is 2.6%, monthly interest will be (100000 x 2.6) / (100 * 12) which is about $217. Increase in housing loan rate can cause a burden to the house owner especially when the outstanding loan amount is huge. Let’s take an outstanding loan of $300,000 as an example. Based on the 1.6% interest rate, the monthly interest is $400. Every 1% increase in the interest rate will increase the monthly interest by $250. In my opinion, this is quite a huge sum of money to fork out. So my advice to all is to spend some time calculating the monthly interest before you commit to use any floating rate housing loan. Low interest rate may not last forever and an increase in loan interest rate will definitely increase your financial burden.